There is an amazing number of extraordinary wines coming from the relatively undiscovered appellations along the Southern tier of France. The Midi, for example, has awoken from a long, sleepy period of cranking out massive quantities of wine of a quality which wasn't worthy of, as some European friends would say, "isn't good enough for even washing your feet." I can recall tasting wines of the Minervois and Fitou appellations in the late 1970s and thinking what horrid wines these were! "How could anybody drink this crap?" I wondered. The French government began encouraging growers to produce less fruit! They had such a wine lake at that time. The predominant varieties were grapes which produced prolific quantities of "vin ordinaire." Combine ordinary grapes with poor winemaking and you have a lot of distilling material. Unfortunately, Peugeots and Citroens run on gasoline! Some of the wines were not much different, sadly. Growers began to replant high-yielding vines with finer varieties. These premium grapes, coincidentally, tend to produce smaller crops. Improved winemaking techniques have revitalized what may be some of Europe's oldest vineyard territory. Value-conscious consumers should also be paying attention to the wines of this sunny and warm region. It can, fairly consistently, produce the sort of wines those of us who appreciate good quality can afford. California's Central Valley growers might take note of this region, because the quality of wine from the southern part of France can be so far superior to the over-cropped, insipid "plonk" coming from Fresno, Lodi and Bakersfield. The Southwest of France, a short drive from Bordeaux, offers a sensational array of good quality wines. This is Basque country and its a rugged terrain covering approximately 215 hectares of vineyards. In the 1600s, records show some 500 hectares being cultivated and the low point bottomed out in the 1980s when a mere 70 hectares comprised the Irouleguy appellation. The red grapes are: Bordelesa Beltza (which is the Tannat), Axeria (Cabernet Franc) and Axeria Handia (Cabernet Sauvignon). White grapes: Izkiriota Ttipia (Petit Manseng), Ixkiriota (Gros Manseng) and Xuri Zerratia (Courbu). There's a tiny bit of pink wine made in the Irouleguy appellation, but, for the most part, this is red wine country. Most of the wine made is produced by a grower's cooperative, but we typically have a splendid red from a small, independent grower. One of the great claims to fame for the wine of Jurancon is that is was used to christen Henry IV. Hank is long gone, but the wines of the region (don't confuse this with the "Jura") are much appreciated here in far away San Francisco! There's Jurancon and Jurancon Sec (dry)...These are white wines and made of Gros Manseng, Petit Manseng and Courbu. The vineyards are typically up in the hills on terraced sites, with the harvest sometimes being prolonged into the time of the first snows of winter. The dry wines, accounting for 75% of the production of the Jurancon appellation, are typically austere and steely-sharp. They are not wines easily appreciated by fans of fat, flaccid California wines. Jurancon Sec is a wine for seafood, though a plate of some sort of slightly sweet and salty ham & melon is a delightful combination. The aromatics are, typically, lightly citrusy and appley with a nuance of honey. Sweet Jurancon wines range the gamut from slightly sweet to grandiose. These can displays notes of tropical fruits such as pineapple, mango and guava, along with some honeyed and spice elements. The region caught the eye of the late Bad Boy of Pouilly-Fume, Didier Daguenau, who purchased a property and who made unctuous sweet wine. The locals often pair the sweet Jurancon wines with foie gras. Madiran is a wonderful deep, dark red wine based on the Tannat grape. Amongst the 1260 hectares of Madiran vineyards, you'll find a bit of Cabernet Sauvignon, Cabernet Franc (known to some here as Bouchy) and Fer-Servadou (the Mansois or Pinenc in some circles). Madiran can be a really good, deep, dark, showy wine. They can also be fairly tannic, so Madiran pairs handsomely with duck, a local specialty. An Italian friend who interned at a famous Bordeaux property told us they'd often include a Madiran as the "mystery" wine against famous names in Bordeaux and the Madiran often won the tasting. Chateau Montus is the most famous producer, but we've found a few of his neighbors offer exceptionally good wine at more sensible pricing. Pacherenc du Vic-Bihl is a white wine covering the same area. White grapes account for approximately 267 hectares. The appellation produces both dry and sweet wine. The indigenous local varieties are Arrufiac, Manseng and Courbu, while the "outsiders" are Bordeaux's Sauvignon and Semillon. We've periodically had wonderful dry whites to pair with seafood and sweet examples for desserts or foie gras. This is a fairly large appellation and there are some great little treasures in this region. There's a lot of white wine produced in this region, using varieties such as Colombard and Ugni Blanc (Italy's Trebbiano). But some producers use Gros Manseng and, perhaps Sauvignon Blanc or Chardonnay to create really flavorful wines that rise above the crowd. Reds can be made of Bordeaux varieties and, perhaps, with Tannat. 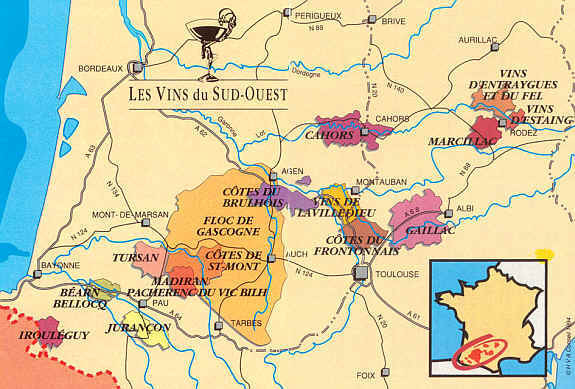 The wines made of the Malbec grape and cultivated in this region were known, once-upon-a-time, as "the black wines of Cahors." Not that they were necessarily exceptionally dark-colored wines, but compared to the relatively light-colored wines from Bordeaux (called by the British "claret" after the French term "clairette"), Cahors wines were dark and inky. The region today comprises approximately 4000+ hectares of vineyards, mostly Malbec (or it may be called "Cot") along with Merlot. There is a tiny amount of Tannat planted in the Cahors region, too. Vintners in this region have been upset that their local grape, Malbec, gets so much attention from wine writers, merchants and wine drinkers when it comes from Argentina. Of course, most French wines are labeled simply with the appellation and one must know which-grapes-grow-where to know where in France Malbec is king. The growers consortium lobbied the French government and, today, you will find (unusually) the Malbec variety mentioned on the labels. But Malbec from Argentina is usually made in New World styles, aiming at big, deep, fruity, low acidity, low tannin and high alcohol. Cahors wines, for the most part, are a bit tannic, moderately acidic and a bit edgy. They are, after all, French wines. We've tasted a few bottlings which aim to be trophy wines and seek high numerical scores, having oxygen bubbled into the fermentation tank, so there are some "new world"-styled Cahors wines. 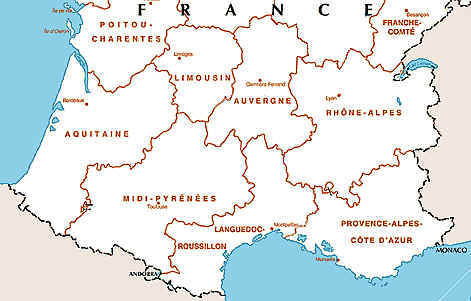 The Fronton region is located just north of Toulouse and it's the home of the Negrette grape. What they call Negrette, California winemakers might know as Pinot Saint George. Perhaps the grape has its origins in Greece, as "Mavro" would equate to the French "Negrette" (black). The name Pinot Saint George is no longer used in California, but we recall bottlings from both Inglenook and Christian Brothers wineries. We've found good Rose and Red wine under the Fronton banners...The wines are not expensive and ten bucks goes a long way. This off-the-beaten path appellation used to be a far more sizeable wine region, but from 4,000 hectares of vineyards a century ago, they're down to something close to 150 today. The bulk of the production in this region, close to Rodez, is made by the grower's cooperative winery. Red wine is king and the regal grape is called Mansois (known as Fer Servadou or Braucol in other parts of the southwest). Marcillac wines must be at least 80% Mansois. Other varieties one might find include Cabernet Sauvignon, Cabernet Franc, Merlot, Gamay and Jurancon Noir. There might still be a vine, or two, of Mouyssague in the region. Our favorite producer of Marcillac tends to make a medium-bodied wine with some spice and pepper (paprika) notes. This was an old Roman outpost and around the 1300s it was known for its lightly sparkling wine, well before those made in the region of Champagne. Today Gaillac is producing table wines, about two-thirds red and rose and one-third in white wine. Chalky soils in the Gaillac appellation allow the white grapes of Mauzac, Le Len-de-l'el, Ondenc, Sauvignon Blanc and Muscadelle to flourish. Stony soils seem to do best with red grapes and one finds a broad spectrum, including Duras, Braucol (or Fer Servadou/Mansois), Gamay, Negrette, Syrah as well as Cabernet and Merlot. Both sweet and dry whites are made in Gaillac and the small amount of bubbly still produced is made from a singular fermentation as we understand it, with the yeast sediment remaining in the bottle until you, the consumer, choose to open and enjoy the wine. For sweet white wines, they employ a curious system of pinching the stems of the grape bunches while still on the vine. This cuts off further maturation from the vine and causes the berries to shrivel or dehydrate, elevating the sugar level. The Bergerac region competes nicely with Bordeaux, but it's far less famous and virtually unheralded these days. The landscape is quite varied and there are some 90 towns comprising Bergerac. Close to 10,000 hectares are devoted to red grapes, usually Merlot and the Cabernets. Approximately 3000 hectares are cultivated with white grapes, principally Sauvignon Blanc and Semillon. Long known as "poor man's Sauternes," Monbazillac can produce a very interesting sweet wine. Less well-known is the Saussignac appellation. Coteaux-du-Quercy, Lavilledieu, Cotes-du-Brulhois, Buzet, Saint Sardos, Cotes du Marmandais, Montravel, Pecharmant, Rosette, Cotes de Duras, Tursan and Cotes-de-saint-Mont. The Languedoc has a long and storied viticultural history, but it's really only in the past decade, or so, that this part of the "South of France" has been making seriously good wine. For so many years, the Languedoc was more noted for its rather industrial wines; wines from vineyards cultivated for high yields rather than high quality. With diminishing consumption in France, the government has encouraged growers to replant with less-vigorous grape varieties which, as it turns out, can often make better quality wine. 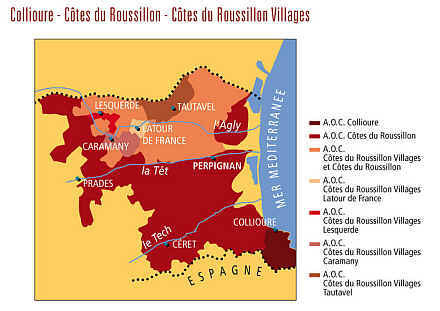 The Roussillon became part of France in the mid-17th century and it was linked to the Languedoc in the mid-1980s as "one" governmental region. Given that the wines of this area tended to be made from over-cropped vines, it was quite common practice to "fortify" them with wine made in a nearby French colony, Algeria. When Algeria gained its independence, blending "foreign" wine was frowned upon, apparently. Who knew? The Languedoc-Roussillon has numerous interesting wine areas with varied soil types, varied altitudes, various levels of influences from the sea and all sorts of people and companies making wine. The phylloxera root louse scourge in the late 1800s devastated the region. It was shortly after this mess that growers tried to graft American root stocks onto French wine grape varieties, with varying levels of success. Economic pressures encouraged the planting of prolifically-producing vines and, as a result, lots of Carignane was planted. This may not have been a good idea at the time when one was searching for good quality wine, but today, some wines made from rather elderly Carignane vineyards can be remarkably good. Of course, old vines tend to produce less bountiful crops which accounts for the increase in quality of Carignane from aged vineyards. This is an appellation which will be terminated as of 2012 in favor of either the more general "Languedoc" designation or more site-specific appellations. 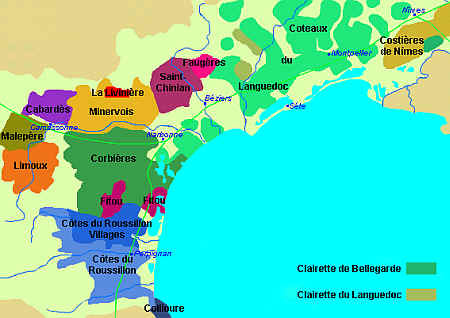 Languedoc is today's general appellation for virtually the entire Languedoc and Roussillon regions. La Clape is a moderately well-known sub-region, with Grenache being mandated as providing 20% of the blend and the trio of Grenache, Syrah and Mourvedre needing to make up at least 70% of the red wine. If it's a pink wine, Grenache must account for 60% of the blend. Whites must feature a minimum of 40% Bourboulenc, with Grenache Blanc, Picpoul and Clairette making up the balance. Pic Saint Loup is a region with numerous fine estates (in our view). It's about 20 kilometers north of Montpellier and we've found good reds, whites and roses of this region. Reds must be at least 90% Syrah, Grenache and/or Mourvedre and there's even a requirement the vines be six years of age or older. Gres de Montpellier can produce some interesting red wines. Montpeyroux seems to be a good source of interesting reds, too. Picpoul de Pinet is a curious wine from the Languedoc...it's white wine made from a grape called "Picpoul," which translates to "lip stinger." It's a crisp, acidic wine that's perfect with seafood from the nearby Mediterranean. 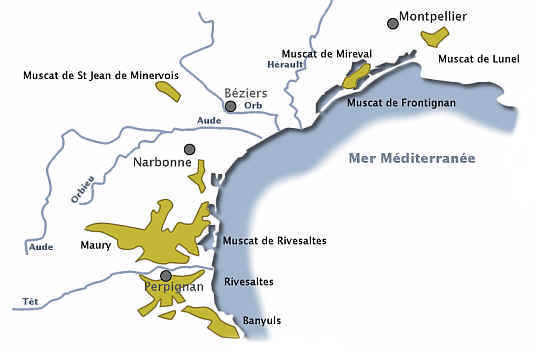 This region is where one finds significant plantings of a white grape called Mauzac. It accounts for a minimum of 90% of the wine in a bottle of Blanquette de Limoux, a bottle-fermented sparkling wine which ranges from Brut to Demi-sec to Doux (sweet). There is a bit of Chenin Blanc in the area along with some Chardonnay, these grapes seeming to be favored in lieu of a variety called Clairette. There's also Cremant de Limoux and Limoux table wine. This appellation gained a bit of prominence in1985 when it received AOC status. It comprises more than 13,000 hectares of vineyards and Carignane is the major red grape. In fact, there's a ceiling on the percentage of Carignane permitted in a Corbieres red: 60% presently. Grenache Noir, Syrah, Mourvedre and Cinsaut fill out the roster of red grapes. White wines in this region tend to be made of Marsanne, Roussanne, Grenache Blanc, Maccabeo, Bourboulenc and Rolle (known as Vermentino to some folks). Most of the Faugeres appellation is about 250 meters above sea level and it covers just a tad more than 2000 hectares presently. Virtually all the production is in Rose and red wine with a mere one percent of the region producing white wine. The Fitou appellation, something like 2600 hectares, is the oldest in the Languedoc-Roussillon, dating back to 1948. Carignane is often blended here with Grenache, Mourvedre and Syrah, though you might encounter Cinsaut and Lledoner Pelut. There's an unusual 'recipe' for vintners to follow...I don't know if this is still the case, but Carignane needed to comprise at least 30% of the blend with Carignane, Grenache and Lledoner making up at least 70% of the wine...They're recently decided to insist on a minimum of 10% of Syrah and Mourvedre. Located just to the north of the Corbieres appellation, Minervois is another red wine-dominated region. It comprises nearly 4200 hectares, with Carignane being an important variety. However, these days Grenache, Syrah, Mourvedre, Cinsaut and Lledoner Pelut are becoming more important. Syrah and Mourvedre are required to make up at least 10% of the blend. There's even a "cru" within the appellation, so you might find a wine with the La Liviniere appellation. The Minervois La Liviniere must have a minimum of 60% of Grenache, Mourvedre and Syrah, with a maximum of 40% of Carignane and Cinsaut. Sandwiched in between Minervois and Faugeres, this 3,200 hectare appellation features Grenache, Syrah, Mourvedre, Carignane and Cinsaut. Some of the wines made here are well-structured and capable of 5-10 years of cellaring. Bordeaux has its influence on Malpere, with Merlot being an important grape, followed by Cabernet Franc for the red wines. The Cabernet Franc plays a more major role in roses from Malpere. Grenache and Cinsaut are found in this 384 hectare appellation. Cabardes is a 400 hectare wine region with Merlot and Cabernet Sauvignon being important and supported by Grenache and Syrah. White wines from the Roussillon are typically dominated by Macabeu and Grenache Blanc with contribution from the Malvoisie du Roussillon, Vermentino, Marsanne and Roussanne. Reds from the Roussillon are often dominated by Carignane, though there's a ceiling of 60%, with others including Grenache Noir, Syrah and Mourvedre. Collioure is an important red and rose of the region. Grenache Noir is the main player in Collioure with Mourvedre, Syrah, Cinsaut and Carignane. There's a bit of white wine from Collioure and this is made from Grenache Blanc and/or Grenache Gris. We've been impressed that virtually all French people know the wine of Banyuls, even though it amounts to a land mass of less than 1200 hectares. The French, you see, are big fans of Port wines. And the French version of Port, for the most part, is Banyuls. And stop the average French citizen in most major cities and ask what wine pairs best with chocolate and the response will usually be "Banyuls, mais oui!" Carignane, Cinsaut and Syrah may be included. Macabeo, Muscat and a grape known as Tourbat are white varieties which may be a small part of the blend. Banyuls must be aged a minimum of 10 months and Banyuls Grand Cru takes 30 months...we've seen some recently-labeled, old "vintages" of Banyuls...these have been lovely dessert wines, but we wonder, frankly, how authentic they are in terms of age. Banyuls is made using a "mutage." This is a procedure where they add alcohol at some point to stop the fermentation...or, if making a dry wine, they add or "fortify" the wine post-fermentation. Alcohol levels in Banyuls is usually a bit less than in Ports and Sherries. This appellation is much larger than that of Banyuls, yet it's a bit of a rarity here in the U.S. market. Four grape varieties : Grenache, Macabeo, Malvoisie and Muscat, with the first two on the list dominating. Mostly 'red' Rivesaltes coming from the Grenache, usually. The wines vary in style, some a bit oxidized and others quite oxidized. We purchased a bottle for a friend's birthday and it was branded as being from the 1950 vintage. Clearly it was labeled recently - I looked on the winery web site and, curiously, their price list and site do not mention any sort of "ancient" vintages. However, a search on this very internet turned up all sorts of offers for elderly bottles. The wine, happily, was good, whatever it was. Ad you might surmise, these are made of Muscat. Two types of Muscat are cultivated in this region, comprising some 5,200 hectares: Muscat a petits grains and Muscat d'Alexandrie. The former is also known as Muscat Blanc, while the latter, Muscat Alexandria, might also go by the name Muscat Romain. These wines tend to be consumed in their youth...these pair wonderfully with fruit desserts and, even, blue cheeses such as Roquefort. This small appellation, a mere 280 hectares, is well in the shadows of Banyuls. Red wines are predominantly Grenache Noir, while the exceedingly rare whites might be Grenache Blanc, Grenache Gris and/or Macabeo. This is an old appellation and the wine is also made of Muscat a petits grains, though it was known as "Muscat dore de Frontignan." A few California wineries used to produce a wine they'd call Muscat de Frontignan...the last to use that designation, if I recall correctly, was Napa's Beaulieu Vineyards. These have to have at least 125 grams-per-liter of residual sugar. Coming from an area just west of Frontignan, these must contain, at least, 110 grams per liter of residual sugar. At a somewhat higher elevation than the preceding appellations of Muscat wines, this region typically harvests its crop several weeks after the others. Muscat a petits grains, as with the others and the minimum sugar content is 125 grams-per-liter.